Somebody asked me to chart the ages of the victims, and the following is a first-pass effort. I've also attached the data so that others can correct the age values if necessary. Janelle Cruz (18) is omitted as the time gap makes the chart look odd. EDIT: Thanks to Bob for help in compiling the data. As usual, N, your charts and graphs are very interesting and provide additional insight into the crimes. What is apparent is that the average age of his victims increased gradually in time. Could it be that average age increased as his age increased, so that in '76 he was attacking mostly victims who were near his age, and by 79 and 80 was assaulting victims whose slightly higher average age reflected his own as well? If one were to interpret the data that way, the average points to an offender who was close to 20-years-old when they began offending. The average age progression of the victims tracks pretty closely with the offender's own age if he did indeed start offending around the age of 20. Very interesting. You could carry this a step further by calculating a correlation coefficient, using probably the Pearson Product Moment CC. It looks like your diagram suggests a weak positive correlation, but the test would give us a quantity value, or magnitude, of the relationship between these two variables. Looking at the scatter diagram I would predict that the positive correlation would not be significant at the 95 percent confidence level, but it would still be interesting to see the actual coefficient value. Just a suggestion. You may have no desire to do this, or no time. Anyway, your graph is nicely presented. Chill and Drifter -- Thanks, I appreciate it. The correlation coefficient calculated for the sample size of 37 is 0.378. Not all that strong, but it is statistically significant at p<0.05. Again, that's omitting Janelle Cruz as the extended time period makes her data point an outlier. If we put her back in, the correlation drops to 0.146 and is no longer significant. Yes, these are standard Pearson calculations and they're a snap to make in a spreadsheet. I didn't mention them earlier because (1) I didn't think anyone would be interested, and (2) we can get a good feel for the data by looking at the graph. There's an awful lot of variation going on in that trend line. While the EAR-ONS tended to attack older victims as time went on, there were many exceptions. It would be interesting to see the chart with all the victim's ages added. It was Bob that asked me to make the chart and we traded notes on the reported data. Port, if you're out there reading this, do you have any of the missing data and would you be willing to share? Oh, nice. A correlation of +.378 is a bit higher than I would have expected. Would have predicted more like +.2 or some such. But quite interesting, especially given the statistical significance. Which means that we can indeed say that as his preference for older females increased as he got older, there was some likely reason for that, and not merely a random occurrence. Actually, for this perp, I think it would be best not to include the Cruz attack, which was really a different time era. If you look at the graph that is where the later victim ages would put his age too if he was inclined to attack people exactly his age. Who/where was the 24 year old victim in 1978? Didn't see your message until today. That would be Victim 31. I'm going to link you to ArKansas' spreadsheet and a Google map that I put together. Can't glean what I'm looking for off of the link. Was the victim a single female who had attended college in either Sacramento or Santa Maria? Google map shows victim 31 was sister to victim 30, crime location Carmichael? We're dealing with the three numbering systems again. You can number the crimes by victims or attacks, and the crimes you include can throw everything out of alignment. LE initially numbered the original canonical set of victims. Then Larry Crompton went by numbered the attacks in his book, Sudden Terror. Because there were two victims in Attack 29, that threw everything off by one that came after. And Because the FBI threw three more crimes into the mix, that threw everything off by even more. On the Google map, it's No. 33. 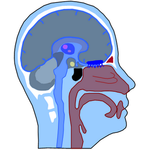 Any of N, has anyone broken down the physical descriptions of Ear based on the sets above and below the line? Is there anything which stands out between the attacks above and below the line? BTW, is the line an average, or what? 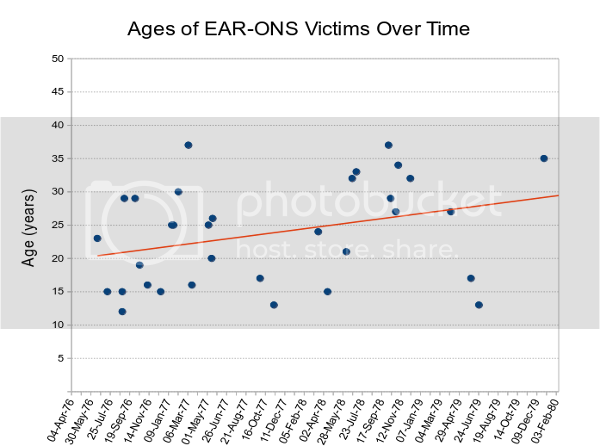 Am I missing the ONS victims? stellar work! Wish there was more stuff like this in graph form for this case.